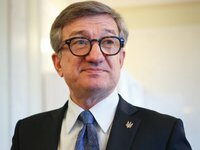 It is planned to stipulate the focus on accession to NATO and the EU in the draft law on the national security of Ukraine, but neither the European Union nor the alliance has confirmed the readiness to accept Ukraine into its ranks, Leader of the Osnova Party, MP Serhiy Taruta, has stated. According to the press service of the politician, Taruta noted that such documents can be submitted to parliament only after receiving confirmation of the attainability of the goals set there. "It is planned to stipulate the focus on joining NATO and the EU. I will begin with the fact that this is populism. We need to get consent from the European Union and NATO before submitting the document with such formulations. As early as December 2016, the Council of the European Union stated that the Association Agreement for Ukraine does not mean the prospects of joining the EU. As for NATO, the situation is even more complicated. Over ten years ago, we were refused to provide a roadmap for joining NATO. Since then Ukraine has never asked this roadmap again," the MP stressed. Taruta noted that the Constitution states about the non-bloc status of Ukraine, that is, the bill requires amendments to the basic law, which will not have 300 required votes of people's deputies.